Twitter is still a hugely popular social network and it can be a very useful tool for creating a following for your up-coming game. We wanted to create a simple guide for game developers to learn the basics of how to use Twitter to your advantage. #IndieDevHour is a weekly event taking place on Wednesday nights at 7pm (GMT). 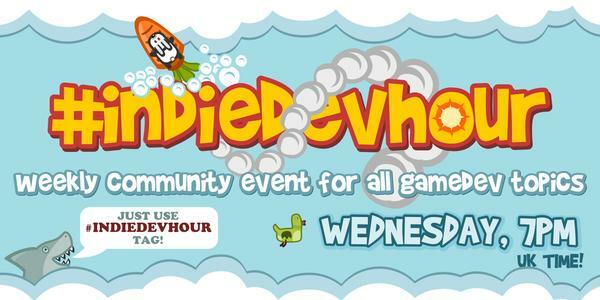 It’s an hour long event which you can join by simply tweeting using the #indiedevhour hashtag. It’s a great opportunity for you to reach out to other developers, get feedback and exchange ideas. #Screenshotsaturday is a great chance to show your work to the public. Every Saturday game designers and developers post screenshots of their work using this hashtag and they are all collected to screenshotsaturday.com. The hashtag is also actively followed by many game reviewers and gaming sites and the best works are often collected to articles. Remember that gifs are an even better way to give a good impression of your game. Don’t be afraid to share screenshots and content from your game. Unless you are working on something very tiny, the chances of someone cloning your game are very low. The more images or videos you share, the more eyes you get on your game! @GameDevsLikeYou has a huge following and often asks game development related questions and then retweets the best answers. Great chance to connect with fellow developers. @theMeatly Draws amazing game development related comics and often shares work from game developers. @McFunkyPants Organises #1GAM (One Game A Month) and is an extremely friendly supporter of indie game developers. Interact with other users on Twitter. Giving other people feedback or help them with their issues often makes them return the favor by checking your game out as well. Pay special attention to users tweeting at you and users who tweet about your game! Find out the hashtags used for tweeting about your selected game development tools. If there is an active development community, there more likely is an actively used hashtag that you can follow and use. Joining the conversation will get you noticed in the community and might just help you with that nasty issue you’re having. There are many more hashtags used by game developers such as #indiedev, #gamedev and #pixelart. Tweets with these hashtags will also get picked up by Twitter bots that retweet them automatically which sometimes help spread the word. By following everyone blindly you might reach the gap of follows Twitter has set at 2,000 (which is increased after you get more followers yourself). Make sure you also unfollow users who haven’t tweeted anything in weeks, as they most likely have stopped using Twitter altogether. There are many tools that help you find users like this, such as StatusBrew. If you want to follow users without actually following them, you can also just put them in a list and follow them this way. Following hashtags, users and lists all at the same time sounds like a hassle and using Twitter’s web interface alone for all this is a tedious task. Thankfully there are many services you can use to manage all these feeds at the same time. 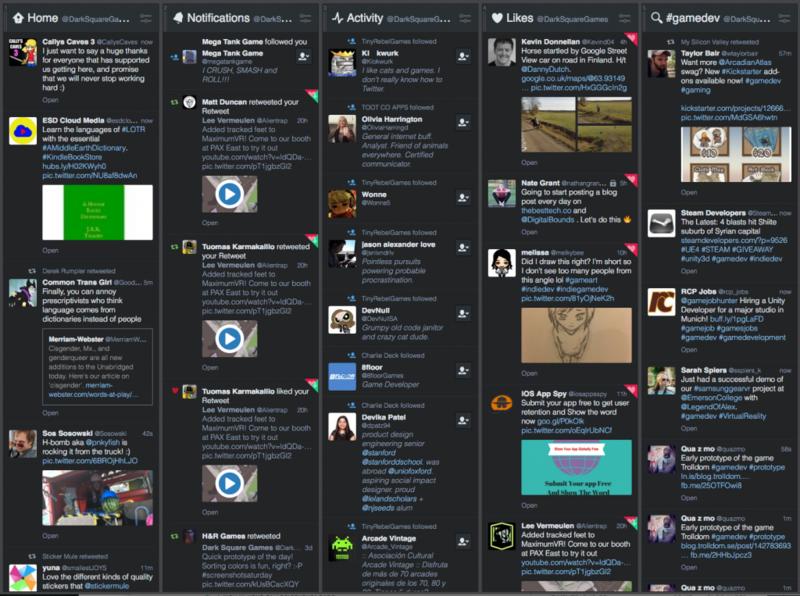 Tweetdeck is a great Twitter client that allows you to create columns for anything on Twitter, including lists, users, hashtags and even just search results.